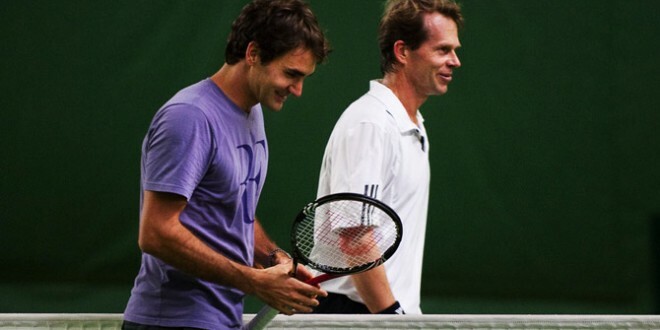 During the off season, Roger Federer spent one week of training with Stefan Edberg, one of his childhood heroes and idols. Rumors swirled immediately of a coaching relationship, and today, the Swiss maestro has confirmed that Edberg will be joining the team alongside Severin Luthi. Federer stated that Luthi has been part of his team for the last seven years, and will accompany him most weeks of the season. Edberg has agreed to work with the 17-time grand slam champion at least ten weeks out of the year, starting with the Australian Open in Melbourne. Via official Roger Federer Facebook page – I am happy to announce that beginning in Melbourne, Stefan Edberg will join Severin Lüthi on my coaching team. Severin, who has been part of my team for the last 7 years, will do most of the weeks and Stefan has agreed to work with us for at least 10 weeks starting at the Australian Open in Melbourne. Stefan was my childhood hero, and I am really looking forward to spending time and learning from him. Federer parted ways mutually after three years with Paul Annacone earlier this year in October. The Swiss star will make his first appearance at the Brisbane International, which begins December 29. Following that and leading into the Australian Open, Federer will take part in an exhibition match with Jo-Wilfried Tsonga, “A Night with Roger Federer and Friends,” to be held at Rod Laver Arena on January 8. In earlier news, the Swiss star and agent Tony Godsick formally created their new agency, Team8.